Section 5C in Traditional Quaker Christianity is on speaking in meeting, so that’s what we’re talking about today. Is this for only me or for the group? Some people find that they experience physiological responses to a call to speak. Mackenzie is in the “heart palpitations and quaking” camp. Yes, we’re called Quakers for a reason! How sure do we need to be about the answers to those questions? Micah says he’s found he more often regrets not speaking than speaking in meeting, so he’s trying to be a little looser. We talk about how in smaller meetings, it may be more appropriate to speak more freely than in larger groups. Micah thinks a 5 minute message that shouldn’t be shared is worse when it wastes 200 people’s time: 1000 minutes. Mackenzie makes a point about the number of available ministers. If 10% of the meeting speaks, and you have 20 people, that’s 2 messages. If you have 100 people, that’s 10 messages. There might not be time to absorb each message. While it may be appropriate for elders to discuss what was said in meeting for the purpose of nurturing the speaker, it is not appropriate to second-guess someone’s discernment about speaking otherwise. That’s gossip. Just because a message didn’t resonate with you doesn’t mean it was wrong. Maybe it was deeply meaningful for the person next to you. We talk about meetings with no vocal ministry at all. The occasional silent meeting in one that otherwise has good ministry can be wonderfully refreshing. We’re concerned about the possibility of newcomers not being sell-served or discipled if a meeting is silent for weeks or months without a robust newcomer or religious education program. We talked about how bits and pieces of a message come together. We think there were more long messages in olden times because there were longer meetings. 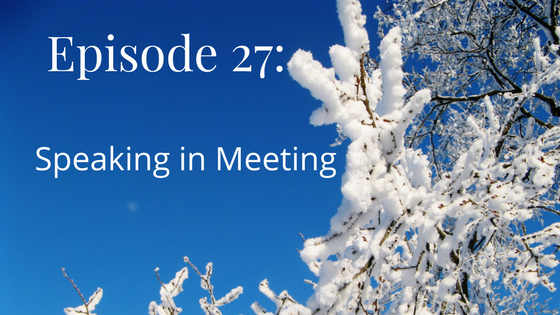 Oh, and while editing this episode, Mackenzie found out that Marlborough Meeting, in Kennett Square (near Philadelphia, PA) is hosting a 3 hour meeting for worship on Saturday, May 5. Mackenzie is planning on being there, for the record. 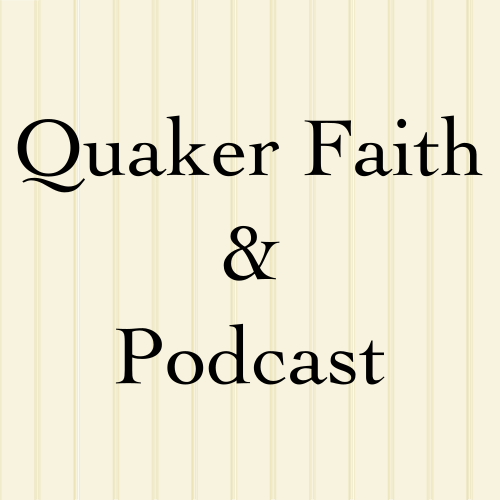 Mackenzie: Welcome back to Quaker Faith and Podcast. We are your hosts, Mackenzie and Micah, and this time we are looking at Section 5C in the book, Traditional Quaker Christianity, which is talking about speaking during worship, or really discerning whether you should speak in worship. Micah: Because often, I think we default to not speaking. So the decision to speak needs to be an active one. Micah: To be honest I’ve more found myself regretting not saying, than saying, and so I’ve tended to try to be, for myself, tried to err on the side of speaking. I don’t think that’s good advice for everyone, but for me I think, I have a pretty high bar for speaking, and so I think it’s been helpful for me to lower the bar slightly, where it’s … I was reading an article about the level of evidence required in different types of cases, both civil and criminal. And in criminal cases, it’s always beyond a reasonable doubt, but in civil cases it can be a preponderance of evidence. I guess you might say that I’ve over time, tended to move from, instead of it being beyond a reasonable doubt, to a preponderance of evidence for speaking. Micah: Well, just to make sure you do understand. Basically beyond a reasonable doubt means it’s beyond … I think that’s self-explanatory, beyond a reasonable doubt that this person was guilty. Mackenzie: I’m just teasing you. Micah: But … Well no, I don’t think people necessarily know what preponderance of evidence is, because I didn’t know before I read these articles. Preponderance of evidence is basically, if more likely than not, the person did it, you have to find guilty. So I guess that’s the standard, like I am … I’ve moved to, for myself is, if after discernment and waiting, if more likely than not, is the message I’m supposed to deliver, I tend to deliver it. Mackenzie: Versus if I’m really, really, really, really, 99% sure, at least. Micah: Yeah, like 99.9. like beyond a reasonable doubt. Like I’m just so overcome by this message there could be no real doubt. That’s a pretty high bar, and one that I found, especially as I become more experienced in vocal ministry, the one that I’ve found unhelpful. Mackenzie: Okay. So one of the things it says in the book is that we must not be paralyzed by the prospect of speaking. And it gives two questions to use to figure out, well, to help decide whether to speak. And the first is, “Is the message for me, or only myself?” And the second … Am I supposed to say, “Is it for this very moment?” And I have heard other ones added to that before, but I can’t remember them now, because those are the ones that I usually think of. Mackenzie: Right. We talked about discerning leadings in some past episode. Mackenzie: I’ve been to one of those. Micah: Yeah. I’ve been to many of them. The bar’s higher. I forget who said this, and maybe many people have said this, but in a meeting, like in a business meeting … And I don’t mean Quakers. In a meeting in the world, for business, for discussion, if you speak in that meeting, and you’re wasting time, you’re not just wasting five minutes of time, you’re wasting five minutes of every individual’s time. And in a meeting for worship, if you get up and give ministry that in fact isn’t led by God, you’re not just disrupting God’s ministry to a few people. You’re disrupting God’s ministry to a lot of people. And there’s only so much time in that meeting for worship, for those several hundred people to receive God’s ministry. And so the greatest danger with speaking wrongly in ministry is not that you’ll say something that would be harmful. It’s that you will block the people who have the actual message. Micah: Mm-hmm (affirmative). Which is considered big for Quakers. Mackenzie: Yes. That’s really big, by at least North American Quaker standards. Micah: The biggest, for me personally, the biggest regular, like not a special gathering, but the biggest regular meeting for worship I’ve ever been to, was the Friends meeting of Cambridge, where they regularly have about 200 people. And at least when I went there, their meeting house was packed. They literally had no space for more people. And I think that’s about as big as it gets, in unprogrammed meetings, is for a regular meeting for worship, it was about 200 people. Mackenzie: Okay. Mostly they seem to be around 40 people I would say, in North America. In Britain, it’s more like 15 to 20. Micah: Well yeah, it totally depends. You go out to the, for example, into the Midwest or the Great Plains, and your average size is probably something like 10 to 20. Mackenzie: Right, which is about the size it is in Britain. I’ve been told that 20 and bigger is a big meeting in Britain, whereas in the U.S., 20 is a pretty small meeting, I would figure. Micah: Again, where I came to Quakerism, in Kansas, 20, for an unprogrammed meeting, 20 is a full size meeting. You wouldn’t say it’s big, but it’s full size. Mackenzie: Okay. Yeah, I would definitely say that 20 is not … 20 is definitely a meeting and not a worship group. Micah: Sure. Yeah, yeah. But actually, just … This is a tangent, but I’m gonna go with it. In Kansas, I’m pretty sure that … I don’t think … I could be wrong, and people from Kansas, if you’re listening, should write in and tell me I’m wrong if I’m wrong. In Kansas I don’t think there’s any meeting, any unprogrammed meeting right now, that has … Certainly it doesn’t have more than 20 people on a Sunday morning and I think maybe none of them have that many. Especially if you exclude Penn Valley for [inaudible 00:08:23] I’ll give you a shout out, who are in Kansas City. They’re technically in Missouri, and I know that they are bigger than 20 on Sunday morning. But in the state of Kansas, I’m not sure that there’s actually a meeting that regularly has 20 or more people on Sunday morning. Mackenzie: Okay. So backing up, two tangents, I was going to say that generally in meetings that are under 10 people, it’s really common to go not just weeks, but even months, not having there be any messages given during worship. Whereas in the larger meetings that have been what I’ve mostly attended, the 70 to 100 people range, it’s common to have I’d say between four and six messages each week. And so just by dint of the fact that you have more people, there are more antennae through which a message can be received. And so having that higher bar with more people, I think that makes sense, because there are then more possible … There are more people there who can minister, and more possible messages to come up, through those potential ministers. And so if they all had a lower bar, then you could end up with what we sometimes call a popcorn meeting, where people are popping up one after another, with only a couple minutes in between, and not really getting a lot of time to settle back into the spirit in between messages and to absorb them, and take them in, really. Micah: Yep. I think you just articulated it really well. But I guess, that lends context to what I was saying earlier, which is, my bar has moved from, as I was [inaudible 00:10:13] with the legal jargon, from beyond a reasonable doubt to a preponderance of evidence. For me now that I think about it, now that Mackenzie’s pointed this out, that has been happening in a context where I used to spend more time in larger groups, where ministry was happening. And more recently I’ve been in much smaller groups. Mackenzie: Right. And I think it’s a negative thing if … Or at least, I agree with you. I guess I can’t necessarily say right because it’s not objective. But my feeling is that, if a newcomer comes to a meeting, and they keep coming to meeting week after week, and it’s been two or three months, and they still haven’t actually heard anybody talk about their faith, that’s a bad thing. They’re not … I’d be concerned that they’re not getting anything from that, that they’re not, I guess learning. And you have … Having a good weekly religious ed system going on would certainly help the newcomer not just be like, “I don’t know. I keep showing up, and there’s all this quiet, and I have no idea what’s going on,” feeling. You gotta have some kind of newcomer class, or have preferably ongoing at all religious ed every week. Micah: And in my … And again, this is anecdotal. I don’t know [inaudible 00:11:51] to surveys or actual evidence-based stuff has been done to determine this, but in my experience and observation, a meeting that normally has solid vocal ministry, that is totally silent one Sunday, that’s typically a healthy thing. That’s typically like God is really ministering the congregation and we don’t need words. But a meeting that doesn’t typically have vocal ministry and doesn’t typically have much activity in that way and is typically totally silent, that typically to me says a very unhealthy meeting, that is actually not being ministered to, and is not gathered. Mackenzie: Well and I’d have the concern that if you go long enough without any vocal ministry and with having new people show up and not … That then they’re being socialized into nobody ever speaks, or that then there isn’t any modeling of what things are appropriate or inappropriate for ministry, because they haven’t heard any examples. Micah: 1800s. Late 1800s. When the Revivalist meetings came in and set everything on fire, and not necessarily in a good way. The context for that was in general totally silent meetings, governed by elders who really cracked down on anyone who was giving inappropriate ministry. So, and an expectation that to speak was just an extraordinary thing, rather than something that any of us could be called to. Mackenzie: Okay. So one of the things talked about in the book is that, ways … Well, okay. It talks about how sometimes you know that you’re supposed to speak, but you don’t know what you’re gonna say, so you stand up, and you wait for the words to come. And sometimes you’ve got a full message and you stand up and share it. I know … I’ve only spoken in meeting, I don’t know, four or five times. But two times ago, I got four words, and that was it, and I knew that was the entire message. And I think on a previous episode, you said that sometimes you get a few words at a time. Micah: Yeah, so that’s definitely been my experience. I feel like I’ve experienced delivering vocal ministry in a variety of ways. There have been occasions when I’ve known I had some … That God had given me something to say, or to deliver, but that’s not always words. Sometimes it’s singing. And I’ve stood up not knowing what was about to come out, and then discovered it in the standing. But often I will have a sense that … Quakers talk a lot about having a sense of things. I’ll have a sense of a message, and by a sense of a message, I mean that words haven’t been attached to it yet, but I have almost a visualization of it. Mackenzie: Like an outline, like when you’re giving a presentation type of thing? Micah: Not exactly, no. It’s more like feeling a terrain. But you haven’t put words to it. But you feel it. Or you just feel the contours of it. But there aren’t words associated with it yet. So sometimes … And that would be the situation in which I might stand up to speak without knowing what I’m going to say. In the technical sense, I don’t know what I’m going to say, in the sense that I don’t know the words that are gonna be associated, but I do have a sense of a message, if that makes sense. But it’s not in a word space yet. Other times, I will actually have fragments come to me, and it’s almost like someone’s started passing me pieces of paper with a couple sentences written on them, and there were several, and they came to me at different times, and then they start seeming like they fit together. And I might stand up knowing, having a pretty good sense of what my first sentence might be. But then I might, after I speak that first sentence, I might have a sense of what the next words are, and keep going. Sometimes, might stop in mid-sentence and wait for the rest of the sentence, and things like that, which again, as we’ve discussed before in previous episodes, leads to a fairly distinctive style of speaking, that Quakers fall into even when we’re not inspired, secretly. But, so … And occasionally, I don’t want to leave this out, occasionally there are times when there’s a full-blown message that I know exactly what I’m going to say. And this is, for me, in the context of the silent meeting, this is more rare, for me, although I think it’s less rare for others, and I think that very experienced vocal ministers in the past probably had a very good idea of what they were about to say at length. Mackenzie: Yeah, we’ve mentioned before that vocal ministers in the past, sometimes had tendencies to minister for 45 minutes, or an hour, just keeping going. Micah: And not so much a tendency as an expectation. It was … As we’ve discussed, int he past, it was very normal for very long sermons to be preached, or multiple sermons that were very lengthy to be preached in the meeting for worship. Because the meetings for worship were longer, and there was an expectation that there would be extended teaching going on. Mackenzie: I’m just gonna cut in during editing to note that I just learned that [inaudible 00:17:30] Friends Meeting, which is in Kennett Square, Pennsylvania, near Philadelphia, is hosting an extended meeting for worship on Saturday, May 5. It’s gonna be three hours long. This meeting is one that is ordinarily very small, but when they host these sorts of events, there tend to be, I’d say something like 20, 30, 40 people there. And so maybe you might want to make a visit, if you’re on the east coast of the U.S.
Micah: Yeah. And so that’s often pointed to like a red … Not a red flag, because a red flag’s a bad thing. But a good red flag, that this is certainly something from God. Mackenzie: It’s like a green flag. Micah: In my experience … A green flag. In my experience, this is often something to pay attention to, but there have been times when I’ve gotten that sense of heart palpitations, and trembling, and then it passed. And I didn’t feel … And in the aftermath, I didn’t feel like I necessarily should have spoken. And there have been times when I have not had … Plenty of times when I have not had any of those physical symptoms, but have just had a sense of, “This is what God wants me to do,” and so I do it. So I think as we become more experienced in discernment, there’s less of a reliance on a particular formula, and more of a dependence on God acting through a variety of situations and phenomena experience. Mackenzie: So reversing this a little bit, the next part in the book talks about listening to the messages. And so the big points about how sometimes you’ll hear a message and it just doesn’t speak to you. Well, maybe it wasn’t for you. Maybe it was for the guy sitting next to you. Micah: Or they could have been totally wrong. Mackenzie: There’s that. But charitably, it might have been for the person next to you. And charity is a Christian virtue. It says that in those events, we should not analyze or dissect it afterwards. Micah: That’s a huge challenge. That’s very, very difficult. Micah: I think the biggest Quaker sport is dissecting vocal ministry after the meeting for worship. That’s bigger than gossip. It’s like a form of spiritual gossip. I’ll confess I’ve been guilty of this plenty. And it feels … When you do it, when I do it, it feels like it’s okay, because it’s spiritual, and I’m practicing my discernment by talking about whether or not this or that ministry was good or not. But the reality is, is honestly, unless you’re having such a conversation in the context of a meeting of elders, who are actually considering how they need to nurture these ministers … And maybe you’re one of those people and it’s appropriate. But unless you’re having conversations of other people’s vocal ministry, from the perspective of looking to nurture the vocal ministry in your meeting, or in your community, then it’s probably an inappropriate … It’s probably … Inappropriate is probably too strong of a word. It’s probably an unhelpful conversation. So you think this person spoke wrongly. What are you gonna do about it? What difference does it make for you to talk about that? So probably the best response, as Mackenzie’s already said, to vocal ministry that seems wrong, if you are not … Including if you’re in a position of leadership and eldership in the meeting, but even … Whether you are or not, prayer, praying for the person. If you think that [inaudible 00:24:07] led astray, pray for them. Pray for them right then. Pray that God would, as they were speaking these words that seemed wrong to you, pray that they would find the right ones and that God would guide them rightly. And you might be surprised by what happens. Mackenzie: It also notes that sometimes what somebody says will either convict or comfort you. And as you can guess from the word convict and the connotations it has, that means that … It makes you really uncomfortable because you know you screwed something up before. Micah: And that’s something to watch for to is, if the ministry … There’s a difference, and it’s sometimes hard to know the difference, but there’s a difference between ministry feeling wrong, as in, “This is not what God’s saying,” and then there’s the feeling of, “This is wrong. I feel bad because of what this person’s saying.” And the second, the latter feeling, is very important to listen to, because a major purpose of vocal ministry is, as Mackenzie has just said, to convict, and to show us our darkness and our sin. Mackenzie: Like you need to change. Micah: Like you need to change, that’s a very good sign about the vocal ministry. That’s a very good sign that it’s from God, and you should listen. Mackenzie: You can find us on the web at quakerpodcast.org. That’s Quaker Podcast on Twitter, Facebook, or Patreon, and on iTunes.